In a small saucepan over low heat, bring the cream just to the boil, stirring constantly. Place the chopped chocolate in a medium heatproof bowl. Pour the hot cream over the chocolate and cover immediately with foil. Leave for 5 minutes, then stir until smooth. Cover the ganache with glad wrap and refrigerate until firm (3-4 hours or overnight). When you are ready to frost the cake, beat the ganache on medium speed for 8-10 minutes until light and creamy. Add the icing sugar, and beat for another 2 minutes to combine. Preheat oven to 180°C/350°F fan-forced. Grease and line three 18 cm/7 inch cake tins. In a medium mixing bowl, whisk the egg whites by hand to a bubbly foam to just loosen. Add the coconut essence, vanilla extract and whole milk and whisk gently to combine. Combine the flours, almond meal, sugar, baking powder and salt in an electric mixer on low speed to just combine. Add the butter and coconut milk, and beat on low speed for a few minutes to moisten the dry ingredients. Increase to medium speed, and beat for 2-3 minutes until pale and fluffy. Scrape down the sides of the bowl a few times along the way. Add the egg white mixture to the cake batter in 3 additions, beating on medium speed for 30 seconds after each addition to just combine. Pour the batter into the prepared cake tins, and bake on the oven’s central rack for 25-35 minutes, rotating halfway to ensure even baking. The cakes are cooked when a metal skewer inserted into the centre comes out clean but moist. Allow the cake to cool in the tins on a metal rack for 10 minutes, then turn out and leave to cool completely. Use a sharp serrated knife to slice off the domed top. In a large heatproof bowl over a pot of simmering water, gently hand-whisk the egg whites and sugar until sugar has just dissolved and mixture appears white (5-10 minutes). Alternatively, use a candy thermometer to whisk until temperature of mixture reaches 70°C/160°F. Ensure you whisk gently but constantly, so that egg whites do not cook. Transfer mixture to the large bowl of an electric mixer, and whisk on medium/low speed until meringue is thick and glossy and holds its peaks, and the bowl feels neutral to touch. It is very important that you whisk until the bowl no longer feels warm, otherwise the butter will melt when added. Whisk for 10-15 minutes, and if the bowl is still warm, turn mixer off and allow meringue to cool further. This will ensure you do not over-whisk meringue. Double check the temperature of the meringue by turning off the mixer, and dipping a clean finger into the centre of the meringue. It should feel room temperature. Once cooled, swap whisk attachment for paddle attachment. With the mixer on its lowest possible speed, gradually add butter one cube at a time, beating for a few seconds between each addition. The buttercream will suddenly loosen and may appear thin or scrambled as you go, but just keep beating on low speed until all of the butter is incorporated. Once all of the butter is added to the buttercream, continue beating on a low speed for a minute or two. The buttercream should be thick and glossy. If it is too thin, the butter was too soft when added, so refrigerate buttercream for 15 minutes to firm up and then continue beating. If it appears too thick or scrambled (literally like scrambled eggs!) the butter was too cold when added, so keep beating on low speed until buttercream is smooth. Add the salt and the raspberry puree, and beat to combine. 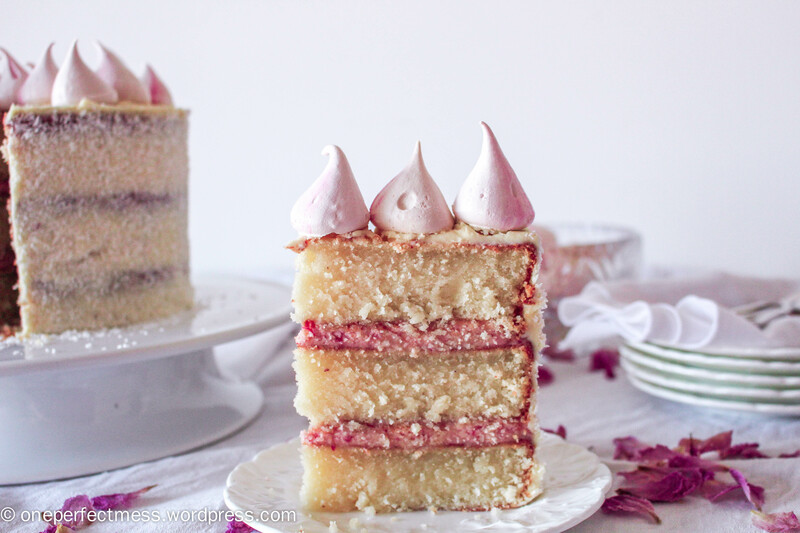 Dollop a spoonful of buttercream on your cake board or serving plate, and secure the first cake layer upside down. Dollop 1/2 of the buttercream onto the first layer, then spread evenly right up to 1 cm from the edge using a butterknife or small offset spatula. Place the second cake layer down, pressing gently from the centre outwards to spread the buttercream to the edges. Repeat with the next layer. Refrigerate the cake for at least 30 minutes before frosting with the white chocolate ganache. In a small saucepan over low heat, warm the raspberry jam to just loosen. Strain through a fine metal sieve to remove the seeds. Set aside to cool slightly. Preheat fan-forced oven to 200°C/390°F. Line a deep roasting dish with baking paper, and pour the sugar in. Bake for 5 minutes, until the edges just start to melt. Remove the sugar from the oven, and reduce the heat to 100°C/210°F. Wipe out the bowl of your mixer. Pour in the egg whites, and whisk on low speed for 2 minutes until small bubbles form. Turn the whisker up to medium/high speed, and whisk for 5-8 minutes until very stiff peaks form. You should be able to hold up the whisker and see that the meringue does not move or flop at all. With the whisker still going at medium/high speed, gradually add the sugar spoonful at a time, whisking well between each addition to ensure sugar dissolves. Add the raspberry jam and whisk for a few seconds to just combine. Using a large metal spoon, very gently fold the food colouring through through meringue mixture to just marble the meringue. Take care to not over mix. Gently spoon meringue into a large piping bag with a 1 cm round nozzle, and pipe meringue kisses onto lined tray with about a 3 cm diameter base. When piping, keep the nozzle close to the tray and positioned in the same spot, and as you squeeze slightly raise the nozzle to allow the meringue to form a peak. Bake kisses for 45 minutes-1 1/2 hours, depending on your oven, until the meringues appear crisp and dry. Use the ‘tap test’ to check that the meringues sound hollow by gently tapping one against the tray, and once you’re satisfied, turn off the oven and open the door slightly, allowing the meringues to cool slowly in the oven until completely cooled (or overnight). 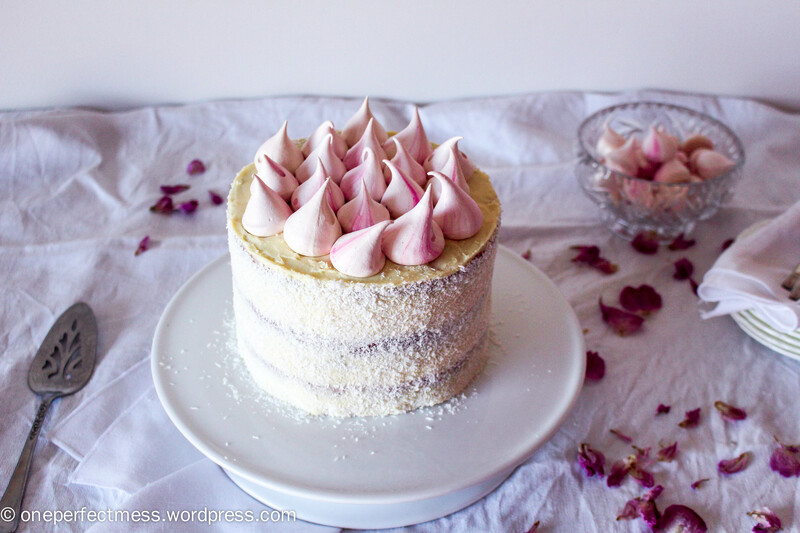 Assemble the cake close to serving time, as the cake shouldn’t be refrigerate once the meringues have been placed on top, to avoid the meringues going soft and sticky. Spread a thin layer of frosting over the entire cake, a little thicker on the top surface. Pat handfuls of the desiccated coconut around the sides of the cake. Secure the meringue kisses in place on the top surface. Store the cake covered and refrigerated for up to 5 days. The cake layers can be made up to 3 days before serving, and stored in an airtight container. Alternatively, freeze the layers for up to 1 month. Swiss meringue buttercream can be refrigerated in an airtight container for up to one week, or frozen for up to 6-8 weeks. Simply omit the raspberry puree before refrigerating or freezing the buttercream. Before using it to frost your cake, allow it to cool to room temperature, then beat on medium speed using an electric mixture until it retains its silky, soft consistency. This can take up to 20 minutes, so be patient if the texture looks a little strange. Once smooth, beat in the raspberry puree and away you go! For ease, if possible prepare the SMB immediately before you frost your cake. Store the meringue kisses in an airtight container for up to 3 weeks. Sounds amazing! Just a question- what is the raspberry jam used for? I can’t see where it has been used after cooking it slightly? Sorry, I just realised I left that bit out! I’ve added it it now 🙂 Add the jam once the meringue is stiff and glossy, and whisk it in for a few seconds before hand-folding in the food colouring. Hope you give it a go! Hi there, what’s the size of the baking tray used for the cake please 🙂 maybe I missed it. Found it 🙂 ignore me. Thanks for this, I cannot wait to try it. Thank you! Hope you give it a go and have a wonderful birthday!! Hi, I baked the cakes last night for my nieces birthday tomorrow and planning on decorating later tonight as i’m working tomorrow. 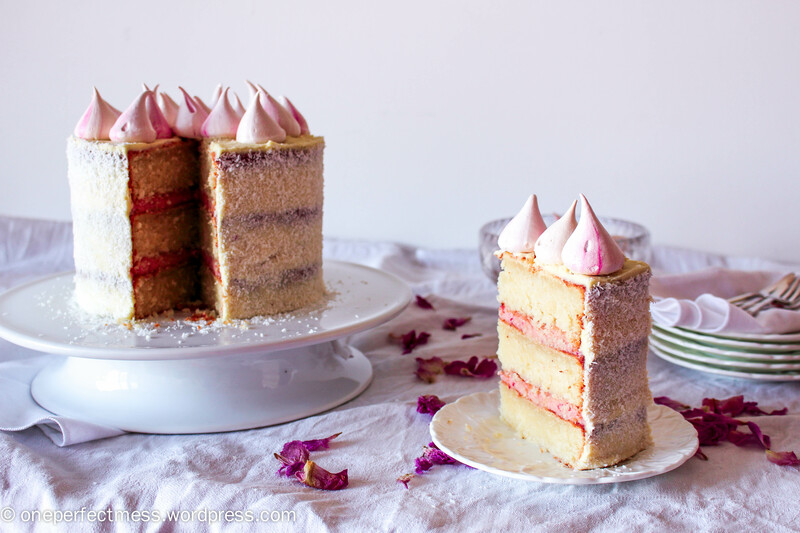 I noticed that the cake is quite moist and wondering whether or not i need to rebake as i found that when handled they seem to be cracking through the middle a little as they are either too moist or are they generally quite delicate cakes? They were definitely cooked through however, not sure if this makes a difference but the tops have sunken so they are flat and seem to not need any leveling. I hope this all makes sense to you. This is my first attempt at doing something like this and i want it to be perfect for my niece, when i saw your recipe i knew this was the perfect one for her. Do you suggest i rebake or is the cake meant to be quite moist? Thank you so much for your speedy response, you just made my day! Can’t wait to buttercream this bad boy up! Thank you thank you thank you! p.s your semi freddo recipes are a massive hit in my household. You are wonderful. Many thanks again. My pleasure!! You’re too kind! It makes my day when I hear from people who are trying out these recipes, so I’m glad you’re having fun with them 🙂 feel free to send through photos of any finished products! Also, I’d recommend waiting until the last minute before putting the meringues on top, so they don’t go soggy before you serve the cake! You may need to either leave the ganache/coconut/meringue decoration until tomorrow, or just make a little extra ganache tomorrow and spread a little dollop on the base of each meringue to secure them to the cake. Have fun!